of the ice a hoar fog leaves when it lifts. All new to this SoCal girl! Like a white coral reef!! Wonderful photo!! Nice shot indeed -- great contrast. Well spotted and captured. V.
Beautiful shot, wonderful color contrast! Looks nice against that polarized sky.. Excellent capture Sandi! This is beautiful. Wow! 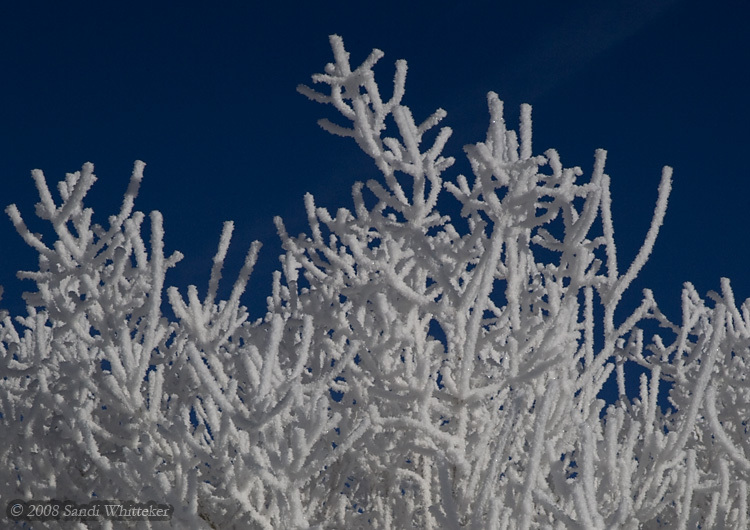 That is some hoar frost. It never gets that thick around here. Gorgeous work. Incredible color contrast...great capture Sandi! Love the white against the blue! They are lovely! It does look like coral..just the freezing kind..great catch, Sandi! Looks like coral, just add fish! !